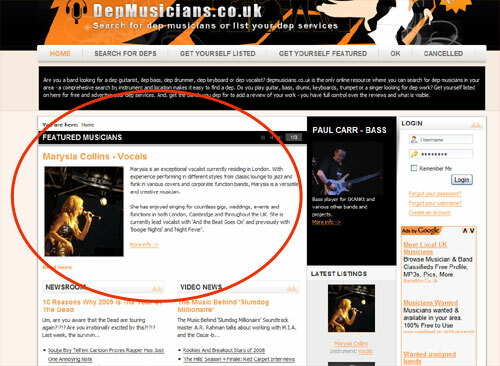 Although gettings yourself listing in the DepMusicians directory is free, there are several reasons why you might want to upgrade to a Featured Musician for just £5.00/month. The large main slot on the home page costs £5.00/month and gets you maximum exposure. You'll reach a much wider audience, increasing your profile, creating earning potential and a network of invaluable contacts. 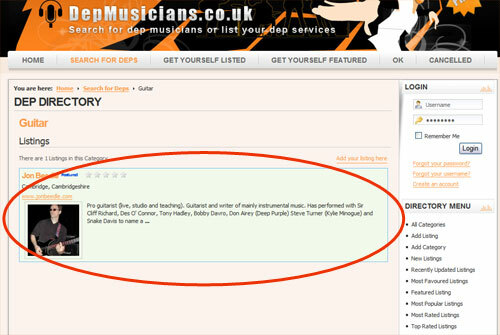 Secondly, as a featured musician, your listing will highlighted in the top of the categories you are listed in the Search For Deps results. It also helps if you get the bands you dep for to write a small review. The most reviewed musicians get listed first and are more likely to earn money from increased gigs, shows, deps and sessions. How do I get myself featured? First you need to login and select My Listing to see your listing. Click the Edit button. You then simply select the type of feature you want and pay online using PayPal. Once we receive notification of the payment, one of our editors will create the home page article using the information in your listing - so make sure it's up to date and has what details you want in it. You will be notified when the page has been added. .